About: The Green Man is a pub that serves a variety of traditional pub food and can cater for private parties of up to 50 guests upon request. They also provide a wide range of entertainment including fruit and quiz machines, background music and a resident DJ on Saturdays playing a host of music. Try to grab a pint here most times I'm round the west end or dragged rounf the shops on Oxf St, and I have to say that this is a great little pub. its recently been refurbished and their new food menu is also a nce change. There's more seating areas during the day so if you're a group of 7 or 8 you can still find a good spot. I havent been here at night so can't really comment on it but for a couple of drink in the daytime I would definitely recommend. This gem of a pub offers more than just a great place to go for a casual drink after work (which admittedly I've done for the past couple of months), but at night turns into a real floor filler. You'll find this lively venue tucked away just off Oxford Street, giving you the chance to escape the hustle and bustle of daytime shoppers while still feeling right in the heart of London. At the weekends The Green Man provides the crowd (consisting of students from the surrounding universities and young professionals) with floor filling modern music and short queues for the bar despite being busy, which is always a good combination in my book. By the standards of central London the place could probably do with a bit of a face lift inside but being on the peripherals of Soho means that the character of the place more than makes up for this. 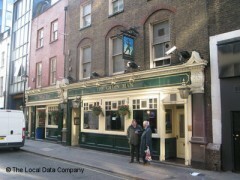 I used to LOVE the Green Man! I was a regular for years. They have switched owners and not only has the food taken a nosedive, my huge complaint is that on the past four visits in a row, there has been no soap in the ladies room. So the female staff - who handle food and drink - are clearly leaving the rest rooms without clean hands. Today was my last visit as the thought makes me ill. Shame. Used to be great! I was in the Green Man last night and two people I was with had their handbags stolen. There is obviously a problem as they have CCTV cameras all over the place and a big stack of incident report forms. Thought people should be warned about the risk of theft when in this pub.